For a number of years, the residents and visitors to the Iowa Great Lakes have been concerned about the threat of Aquatic Invasive Species (AIS). There are a dozen types of invasive species, but the two that are of the most concern to us are Eurasian watermilfoil and zebra mussels. Eurasian watermilfoil forms a thick mat of weeds that prevents boating, swimming, and fishing. In the fall of 2007 it was found the tiny zebra mussel population at Clear Lake had increased exponentially. Now Clear Lake docks and hoists are covered with zebra mussels. With this new zebra mussel outbreak at Clear Lake, we need to significantly increase our efforts to protect the Iowa Great Lakes. Zebra Mussels — Clear Lake (Iowa) is infested with zebra mussels. Any boaters that have been in Clear Lake or that area should be given special attention. Many boaters from Kossuth County use Clear Lake. Lake Delhi and the Mississippi River are also infested. Eurasian Watermilfoil— Almost all of the lakes around the Twin Cities have Eurasian watermilfoil. Any boaters that have been around the Twin Cities should be given special attention. If a boat, motor, trailer, live well, etc. have been out of the water for a considerable length of time (five days minimum — ten days better) any AIS should have died. To be absolutely sure, everything should be washed with hot water and allowed to dry before entering the lake. 1.Transport an aquatic invasive species on a public road. 2.Place a trailer or launch a watercraft that contains or to which an aquatic invasive species is attached in public waters. 3.Operate a watercraft in a marked aquatic invasive species infestation area. The Iowa fine for transporting AIS is up to $500 plus costs. For the past four summers, three DNR Water Patrol Officers have been stationed on boat ramps to educate boaters about the threat of AIS. While on the boat ramps these officers are also inspecting boats and trailers for any signs they are carrying AIS. But with 12 major boat ramps and three officers, many boat ramps are left uncovered. The major coverage concern is for weekends and holidays when the number of boaters using our ramps increases significantly. Two summers ago we launched a program for volunteers to assist the DNR at major boat ramps on busy weekends and holidays to help prevent AIS from entering the Iowa Great Lakes. Each volunteer would cover a boat ramp for two hours each summer month to educate boaters about the harm AIS can do to our lakes. Some volunteers may want to contribute more than two hours per month – that is encouraged. The volunteers would also inspect boats and trailers to be sure they are not carrying an Invasive Species. Volunteers will be provided a DNR identification vest and a procedure checklist for conducting the interview with the boater. Each lake protective association plays a critical role in organizing volunteers to cover the boat ramp(s) on their lakes. Contact your Lake Coordinator to provide your name and contact information. The use of email is preferred because it requires less real time contact. Obtain your volunteer items (Orange vest, clipboard, AIS brochures, boater’s maps, trailer stickers) from the DNR Fish Hatchery or the Maritime Museum. Our experience is that 99% of the boats and trailers coming to the Iowa Great Lakes are free of Aquatic Invasive Species. However, we need to be vigilant for that one percent that could bring Eurasian milfoil or zebra mussels to our lakes. Boater education will pay dividends even when a DNR officer or volunteer is not at the boat ramp. We have three protection advantages that infected lakes in Minnesota and Wisconsin did not have. We are much further from the AIS source of Lake Superior and Lake Michigan. Iowa lakes are much further apart than Minnesota and Wisconsin lakes. We have a high percentage of boaters who trailer to the Iowa Great Lakes and do not use other lakes. What If You Find AIS? There are many native plants and mussels that can look like Eurasian watermilfoil and zebra mussels. Look at your sample very carefully. 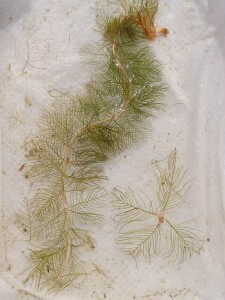 Eurasian watermilfoil has 12– 21 leaflet pairs and is limp when removed from the water. Adult zebra mussels have D-shaped, fingernail-sized shells with stripes. For confirmation, call one of the Conservation Officers: Gary Owen cell phone 712/ 260-1018 or Jeff Morrison cell phone 712/ 260-1017. The Conservation Officers have two-way radio contact with the Water Patrol Officers. Another resource is a DNR Fisheries Biologist at the Spirit Lake Fish Hatchery 712/ 336-1840. Save the sample by wrapping in a wet paper towel, place in a sealed plastic bag, and note the location found and the last water body used. More information on AIS can be found at the Water Safety Council website: www.watersafetycouncil.org – click on Aquatic Invasive Species. What About the Jumping Fish? One species of Asian Carp — Silver — is of great concern to boaters. The Silver Asian Carp can jump several feet out of the water when a motorboat goes by. These fish can grow to three-feet in length and can weigh up to sixty pounds. These fish can jump into boats and can jump into the face of boaters, skiers, and tubers causing injury. We had not been too concerned about these jumping fish in the past, because they were in Illinois Rivers, SE Iowa Rivers — generally well southeast of the Iowa Great Lakes. Now Asian Carp are being found in the Missouri River along the Iowa border with Nebraska. 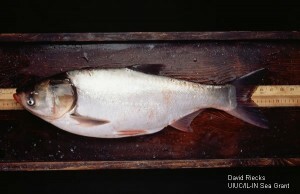 The Bighead Asian Carp — a brother of the Silver variety — have been observed below the Lynn Grove dam (32 miles south of the Iowa Great Lakes). The DNR does not expect the Silver Asian Carp to arrive in our lakes by boat and trailer, as would Eurasian milfoil and zebra mussels. The jumping fish would probably arrive here by swimming up the Little Sioux River and through Mill Creek. The DNR believes the Lynn Grove dam provides some protection from this jumping fish. The DNR is investigating a fish trap to be located south of Milford to provide additional protection. 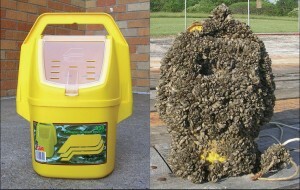 For more information, check the website www.watersafetycouncil.org click on Aquatic Invasive Species.